The Russian plane was carrying 92, including members of Russia's world-famous army choir. 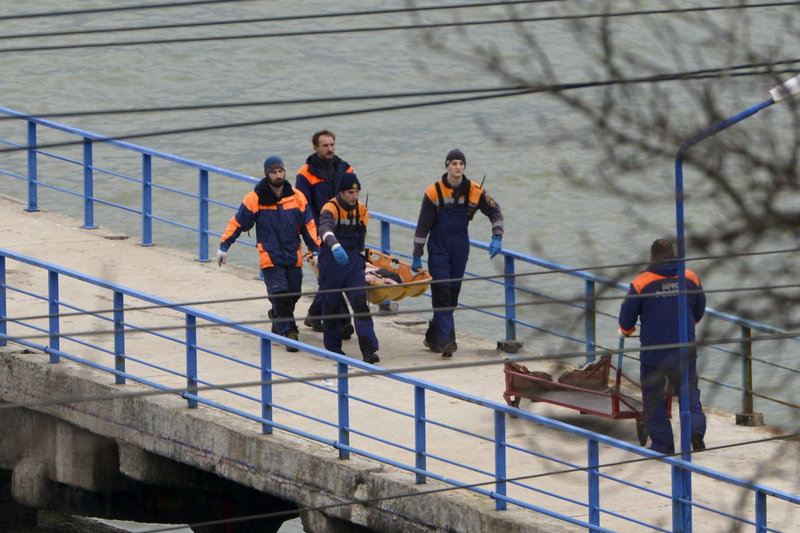 SOCHI, Russia — Backed by ships, helicopters and drones, Russian rescue teams searched Sunday for victims after a Russian plane carrying 92 people to Syria crashed into the Black Sea shortly after takeoff. Investigators said they were looking into every possible cause for the crash, including a terror attack. All 84 passengers and eight crew members on the Russian military’s Tu-154 plane are believed to have died when it crashed two minutes after taking off at 5:25 a.m. in good weather from the southern Russian city of Sochi. The passengers included dozens of singers in Russia’s world-famous military choir. More than 3,000 rescue workers on 32 ships – including over 100 divers flown in from across Russia – were searching the crash site at sea and along the shore, the Defense Ministry said. Helicopters, drones and submersibles were being used to help spot bodies and debris. Powerful spotlights were brought in so the operation could continue all night. Emergency crews found fragments of the plane about 1 mile from shore. By Sunday evening, rescue teams had recovered 11 bodies and Transport Minister Maxim Sokolov said fragments of other bodies were also found. Asked if a terror attack was a possibility, Sokolov said investigators were looking into every possible reason for the crash. Several experts noted factors that suggested a terror attack, such as the crew’s failure to report any malfunction and the fact that plane debris was scattered over a wide area. The plane was taking the Defense Ministry’s choir, the Alexandrov Ensemble, to perform at a New Year’s concert at Hemeimeem air base in Syria’s coastal province of Latakia. Those on board also included nine Russian journalists and a Russian doctor famous for her work in war zones. The Black Sea search area – which covered about 4 square miles – was made more difficult by underwater currents that carried debris and body fragments into the open sea. Sokolov said the plane’s flight recorders did not have radio beacons, so locating them on the seabed was going to be challenging. The Tu-154 is a Soviet-built three-engine airliner designed in the late 1960s. More than 1,000 have been built, and they have been used extensively in Russia and worldwide. The plane that crashed Sunday was built in 1983, and underwent factory check-ups and maintenance in 2014 and this year, according to the Defense Ministry. Magomed Tolboyev, a decorated Russian test pilot, said it was clear that all on board had died in the crash. Before Sokolov spoke to reporters in Sochi, senior Russian lawmakers had ruled out a terror attack, arguing that the military plane was under reliable protection. Security is particularly tight in Sochi, the Black Sea city that hosted the 2014 Winter Games and is regularly visited by Putin, who often receives foreign leaders at his residence there. But some experts said the crew’s failure to report a malfunction pointed at a possible terror attack. “Possible malfunctions … certainly wouldn’t have prevented the crew from reporting them,” Vitaly Andreyev, a former senior Russian air traffic controller, told RIA Novosti. Vadim Lukashevich, an independent aviation expert, told Dozhd TV that the crew’s failure to communicate an equipment failure and the large area over which the plane’s fragments were scattered raises the possibility of an attack. Alexander Gusak, a former chief of a SWAT team at the main domestic security agency, the FSB, told Dozhd that Russian airports are still vulnerable to terror threats despite security cordons. “It’s possible to penetrate them. It’s a matter of skills,” he said. In August 2004, two Russian planes were blown up in the skies over Russia on the same day by suicide bombers, killing 89 people. A Chechen warlord claimed responsibility. In the last year, the Russian military has repeatedly flown Russian singers and artists to perform at Hemeimeem, the main hub for the Russian air campaign in Syria. The passenger list released by the Defense Ministry included 64 members of the Alexandrov Ensemble, including its leader, Valery Khalilov. The ensemble is the official choir of the Russian military and also includes a band and a dance company. The choir sang “Get Lucky” at the opening of the 2014 Winter Games in Sochi, becoming an online sensation. Also on board was Yelizaveta Glinka, a Russian doctor who has won wide acclaim for her charity work, which has included missions to war zones in eastern Ukraine and Syria. Her foundation said Glinka was accompanying a medical shipment for a hospital in Syria. In recent years, Russian airlines have replaced their Tu-154s with more modern planes, but the military and other Russian government agencies have continued to use them. While noisy and fuel-guzzling, the plane is popular with crews that appreciate its maneuverability and ruggedness. “It’s an excellent plane, which has proven its reliability during decades of service,” veteran pilot Oleg Smirnov said. Still, since 1994, there’s been 17 major plane crashes involving the Tu-154 that have killed over 1,760 people in all. Most resulted from human error. In the latest previous deadly crash of a Tu-154, a plane carrying Polish President Lech Kaczynski and 95 others crashed in April 2010 while trying to land at a military airport in Smolensk in western Russia, killing everyone on board. Investigations by both Polish and Russian experts blamed pilot error in bad weather, but Polish authorities have launched a new probe.